The Pulau Redang Marine Park consists of 9 islands and is located 12 nautical miles North East of Peninsular Malaysia. This group of island is recognized as having one of the best coral reefs and marine ecosystems in Peninsular Malaysia and is the preferred destination for Malaysian divers. Pulau Redang is rewarded with nutrient rich waters from the South China Sea and is home to many variety of marine life and reef building corals. 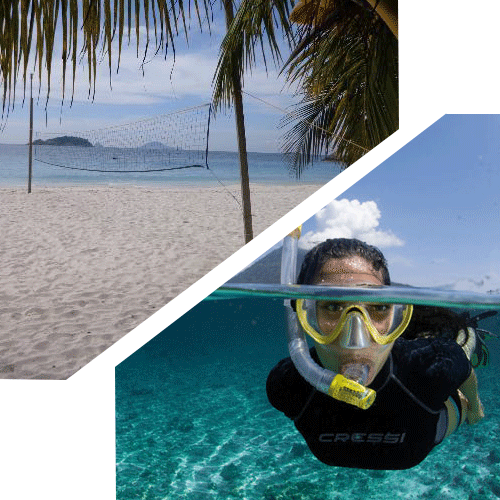 The island is an ideal place to combine diving activities, snorkelling or just a relaxing beach vacation. Our resort was first established in the year 2000. It has since seen many thousands of visitors pass through our private beach. Many couples come here for a romantic and secluded getaway. Divers are always fascinated by the marine life that is around the Redang Island, as well as the by the wide variety of species at our own house reef. Sightings of turtles and baby sharks is not uncommon. Accomodation is made from native materials of Malaysia and is based on twin or triple share. We have 38 rooms with ensuites and the comfort of air-conditioning which is available 24 hours. Diving, snorkeling, fishing, beach volleyball, kayaking, board games and a mini karaoke. Our resort shop sells a range of t-shirts, film, batteries, toiletries, souvenirs, etc. The resort office is equipped with public telephones and a fax machine for communication with the mainland. Should you wish to have slightly more formal discussions, a meeting room is available for your usage. Diving, Boat, Tanks, Weights, Dive Guide. Return pick-up and transfers from Kuala Terengganu airport / bus station to Merang Jetty. Return boat transfer from Merang Jetty to Redang. Free flow of hot and cold beverages. (Alcoholic and carbonated drinks can be purchased at the bar). Indoor & Outdoor Recreation & Facilities. 2130: Meet at Golden Mile Complex, Beach Road. 0800 – 0830 1st boat transfer to Merang.